I have to admit, I'm a bit anxious whether Njessi will approve of this post. I'm talking about fashion! Sort of. And I'm not really qualified! Oh no. I have established before that I'm a full armour fangirl. With that in mind, it feels kind of like a naughty confession to admit that my Jedi knight is wearing an orange belly top (not the one pictured above, but one that uses the same model). Worse, it's not the right armour type for her either; I made a conscious decision to sacrifice some armour for looks (at least while levelling) as a heavy armour equivalent doesn't currently appear to exist in the game. It started out innocently enough when I first found a green chest piece that used the same model back on Tython. Initially I scoffed a little at how skimpy it looked but I wasn't too concerned with it at the time. 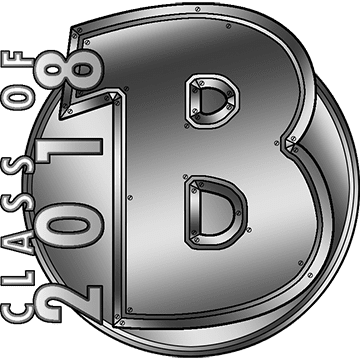 Over time, it even grew on me... and when I got my first robe, I wore it for about ten seconds before discarding it again. Robes can look so unflattering on the larger female body types, it's not funny. 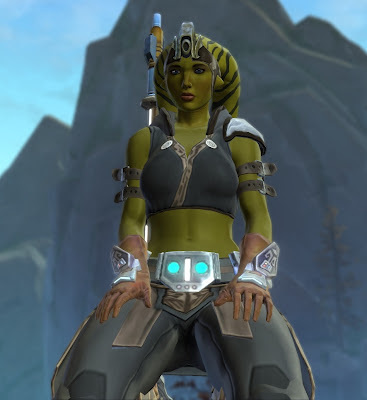 Back to showing off my twi'lek's toned green belly it was! In a way I still feel a little bad about the outfit because it is more than a bit ridiculous to go into battle like that. However, my knight is a bit of a daredevil, so I can absolutely see her taking unnecessary risks for no reason. The force protects her more than any armour anyway, right? Most importantly though, every time she force leaps, I think it looks less like an attack and more like some sort of gymnastics move. And for that, a light top like the one she's wearing is simply perfect. I have to admit I've been really slack in terms of min-maxing and haven't bothered to get lots of crafted gear to enhance my stats with augment slots. My current tier gear serves me fine. With one exception... the helmet, which looks like someone draped a sheet over their head and drew a face on it (link goes to the tanking version, since that's the only one that has a picture on Torhead right now). Fortunately, a guildie crafted the above for me, a Tempered Laminoid Helmet (screenshot on Torhead is inaccurate). Most of my guildies actually think that it's hideous and that I'm mad for wanting to wear this "bike helmet", but personally I love it. I think it looks sleek and Star Warsy and matches the rest of my gear. I even had a second one made for my PvP set, since I'm not too keen on the trooper helmets featured there either. And I did get one guy randomly whispering me in a warzone once to tell me how awesome he thought my helm looked. So nyah! 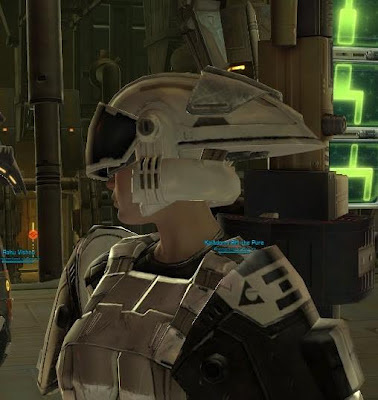 Lastly, we have my operative modelling the Cademimu Sharpshooter set, minus the helm - she's wearing Flexiglass Battle Headgear in the head slot instead. 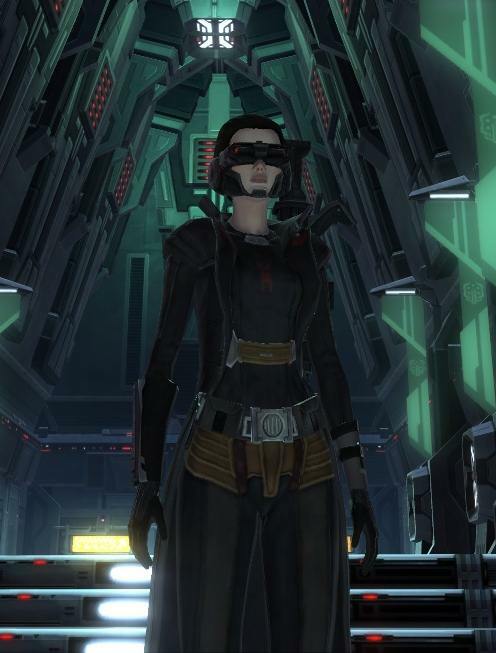 Anyway, funny story behind this set: I'd been wearing the same chest piece for thirty levels or so because I had never seen anything that I liked more than my Black Talon Operative's Jacket. Then I was boosting my boyfriend's marauder through Cademimu one day, and the last boss dropped the above chest piece. My dear man had just rolled greed on everything, but I paused to preview the chest for a moment. Could it be...? Finally something that looked cooler than my Black Talon jacket? I've got to... - and zap, my graphics card spazzed and my screen went black before I could roll need. D'oh. I was so pissed off by this that I then spent the rest of the evening soloing Cademimu until I could get the jacket to drop again. Took me five or six tries I think, but it was totally worth it. I like the helmet :( Your guildies are dummy-faces. You can join the Cool Kids' Club. Unfortunately, for a knight, you have very few options. Most of your options are hoodie robes or hoodie capes. I'd be perfectly happy with a tunic that had belly coverage, but there is none available! However, I couldn't keep the belly shirt on my sentinel because my sentinel is body type 1 and it looked ridiculous - like a pre-teen raiding mommy's closet. I'm considering social gear options for 1.3 (the Belsavis prisoner outfit springs to mind). Yeah, a simple tunic was what I was initially looking for as well. I agree that body type makes a big difference though. I actually like robes and other flowing garments on small characters (refer to my body type 1 agent and her trenchcoat above), as it makes them look more substantial - but on the larger bodies it just turns into overkill and they start to look oddly "bulgy" and clumsy. This is why I run around without a shirt on most of the time on my Knight, body type 3, everything else looks stupid on him.